Death by Chocolate is her favorite dessert. And those knitting needles aren't just for craft projects. To most people, Gin Bombay is an ordinary single mom. Then again, they don't know she's from a family of top secret assassins. Somewhere between leading a Girl Scout troop for her kindergartner--would nooses count for a knot badge?--and keeping their puppy from destroying the furniture, Gin now has to take out a new target. Except this target has an incredibly hot Australian bodyguard who knows just how to make her weak in the knees. But with a traitor threatening to expose everything, Gin doesn't have much time indulge her hormones. She's got to find the leak and clear her assignment...or she'll end up next on the Bombay family hit list. As an avid reader, I've seen a number of books that have cute titles, but writing that doesn't live up to that title. 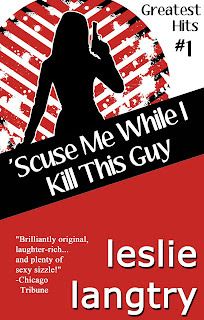 When I came across 'Scuse Me While I Kill This Guy from Leslie Langtry, I was immediately captured by the title and the description made the book even more appealing. I'm happy to say that Leslie's writing lives up to the title. Not only is the book funny and unique, but it's impossible to put down. The character Ginny Bombay is one that women can't help but love. A single mother who's also tied into the family business - a business of murder. What's worse is that her little girl will soon begin training to become an assassin as well. Throw in an extremely hot Aussie and a big pinch of humor and you've got a book that every woman's book club should add to their reading list. UnGuarded by Ashley Robertson - Prime Freebie! Brand of Annwn by J.A. Biggs - Prime Freebie! Urban Necromancer by Phil Chard - Prime Freebie!